New industrial and logistics facilities are helping solidify Kizad’s reputation as a fast developing business hub positively impacting the UAE’s drive towards diversification. Kizad, the abbreviation for Khalifa Industrial Zone Abu Dhabi, has seen investments totalling hundreds of millions of dollars in recent months in a variety of business segments including manufacturing. The hub is adjacent to Khalifa Port, which boasts some of the most modern facilities and offers large capacities for container and other cargo. Khalifa Port, designed to serve Kizad and other industrial enclaves, will expand and modernise its facilities from time to time to meet emerging needs of the business communities in its vicinity. An important milestone last year was the completion of Phase One of Kizad Logistics Park (KLP), covering an area of more than 45,000 sq m. All of its 41 warehouse units have been leased to national and international investors. Phase Two, which will add another 32 warehouse units, is expected to be completed this year. As part of a larger scheme, the logistics park, when finalised, will provide a total area of around 120,000 sq m and is designed to become a major regional logistics and warehousing centre. 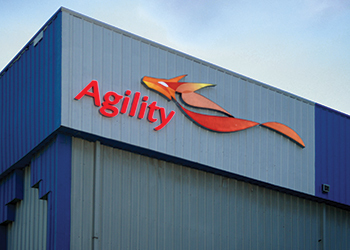 Agility, one of the world’s leading providers of integrated logistics, and United Printing & Publishing, one of the largest newspaper print companies in the UAE, are two examples of the high-profile enterprises that have chosen KLP as their logistics base. Other tenants there include First Gulf Bank, Al Kabeer Foodstuff, Galaxy Building Materials, Back Office Logistics, Oriental Fasteners, Protect Middle East, Creative Communication and Smart Design. A star investor at Kizad is Emirates Aluminium (Emal), part of Emirates Global Aluminium. Contributing large volumes to the Gulf’s primary aluminium capacity, Emal has inspired several establishments to set up projects in the downstream including an aluminium rod and conductor plant that Ducab will be building. The plant, now under construction, is being set up close to Emal, from whom it will receive molten metal to produce electrical conductive grade aluminium alloy rods, wires and overhead conductors. These products are to be shipped though Khalifa Port which serves 20 shipping lines and offers direct links to 52 destination ports around the globe. Cast Aluminium Industries (CAI), the mid-stream aluminium producer and recycler, signed up to bolster Kizad’s aluminium cluster. When its facilities are completed at the hub, CAI will be able to supply a wide array of clients within and outside the UAE. 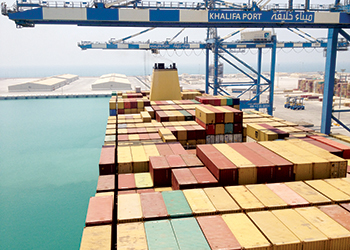 It initially expects to export 300 teu of containers annually through Khalifa Port. Manufacturers of building materials, food products, plastics and packaging and chemicals and pharmaceuticals are among a clutch of investors installing their assets in Kizad. Last month, Gulf Precast, the largest precast concrete company in the UAE, announced it is setting up its plant in Kizad (See Building Materials feature in this edition). That announcement came weeks after Gemini Building Materials, started construction of its new manufacturing venture at the hub to make aluminium ceilings, T-grid ceiling suspension systems and metal profiles that cater to the interior finishing market. Gemini has been part of the Middle East’s construction industry since 1995. “The move to Khalifa Industrial Zone will strengthen our business offerings while boosting our services and competitiveness, especially with regards to regional and international markets. The facility in Khalifa Industrial Zone is expected to show an annual increase between 12-15 per cent and offers an opportunity to widen our product range,” said the company’s managing director Ganesh Babu. The plastics and packaging segment is expanding in Kizad. Technovaa Packaging Industries, maker of paper products and plastic film, is constructing a plant that will further support its other branches in Dubai and Ras Al Khor. The company, part of Darvesh, has plants in the Middle East, Asia, Africa and Europe and is said to have pioneered the use of biodegradable and recycling technology in the Middle East. Other segment tenants that have chosen Kizad as their production base include Polysys Additive Technologies, Gulf Printing and Packaging and Palletco. Polysys focuses on the production of polymer stabilisers called Songnox One Pack Systems, which is a multicomponent tailor-made blend of additives in a pelletised form. When producing plastics, which are polymerised products, additives serve as a critical component ensuring that the products achieve important characteristics such as ease of processing, UV resistance and protection against heat degradation. Gulf Printing, a subsidiary of Al Khat Packaging Company, will produce folding paper packaging and printing products, mainly for the UAE, Saudi and South African markets. Al Khat is one of the largest producers of printing and packaging materials in Kuwait. In the sphere of food products, National Catering Company (NCC) Group, recently secured a 25,000 sq m plot in Kizad where it will set up its new central production unit, laboratories and warehousing facilities plus a new headquarters building. The new plant will allow NCC to further expand on its food processing business and its catering service. At present, eight national and international investors from the food sector are in the process of settling in Khalifa Industrial Zone and will make use of its unprecedented transportation and logistics network connecting sea, air, road and soon rail. Most recently, in November 2014, Brasil Foods (BRF), the world’s seventh largest food company, opened its Middle East plant in the industrial zone where the organisation is focusing on the further expansion of its popular Sadia brand. The plant with investment of Dh533 million ($145.12 million) will have production capacity of 80,000 tonnes annually to supply meat items, marinated processed foods and bread-based products. Life Pharma is constructing the GCC region’s first pharmaceutical research and manufacturing facility to produce anti-cancer drugs. Other companies in the segment include Saif Khaili Group, which is building the UAE’s first plant to make caustic soda and other chlorine derivatives. Its products will be used in various industry sectors ranging from aluminium and oil to steel and chemicals with production capacity of 400,000 tonnes per year.